Looking for a sweet gift for someone who's feeling under the weather? 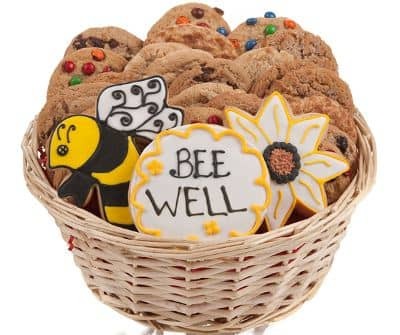 Delight them with our freshly baked cookie basket complete with a Bee Well message cookie. A Bee Well Cookie Gift Basket is a great way to send a surprise for any special occasion or holiday! Your Bee Well cookie gift arrives in a gift basket complete with a decorative bow.